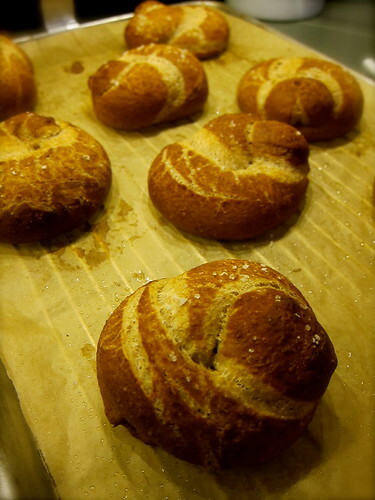 Buttermilk Pretzel Rolls, those three words combined says it all. They fit snugly in the palm of a hand, as a roll should, and, like a pretzel, beg to be torn apart to be fully enjoyed, with the buttermilk lending a homey tang. They’re perfect for a mid-afternoon snack, especially fresh from the oven. Mostly, though, we’ve been having them for breakfast, and, if it’s a leisurely morning, slathered with cream cheese, and topped with slivers of red onion and smoked salmon. These rolls were one of several ways we’re trying out “Baker’s Blend,” an organic flour made with Maine whole wheat and available through Crown O’Maine Organic Cooperative: “Although Maine currently has three fine stone mills in operation, we do not have a white flour mill. Fiddler’s Green Farm, a custom mill and baking mix blender we all know and love, was willing to craft a ‘Baker’s Blend’ for Crown O’Maine. Alan mills Aurora Mill’s cleaned wheat berries, and blends in a high quality white flour from Natural Way Mills. The result is a flour that is wholesome, 50% Maine grown, and very versatile.” As we soon found, the freshly milled whole wheat in the Baker’s Blend gave the rolls a nutty sweetness, with the hefty bran balanced by the lofty white flour. 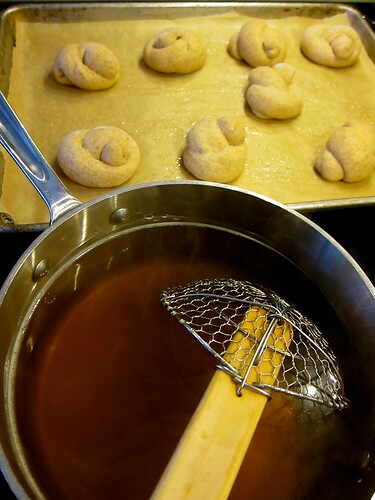 Like bagels, pretzels need a quick dunk in a boiling bath of water and some kind of sweetener — sugar, honey or maple syrup. Often, a recipe will call for the addition of baking soda to the poaching liquid. 6 tablespoons of seemed an alarming amount, it certainly did to me. As it turns out, a chewy bagel or pretzel crust depends on the alkalinity baking soda brings. Naturally occurring alkaline water may account for the particular quality of bagels and pretzels from certain places. 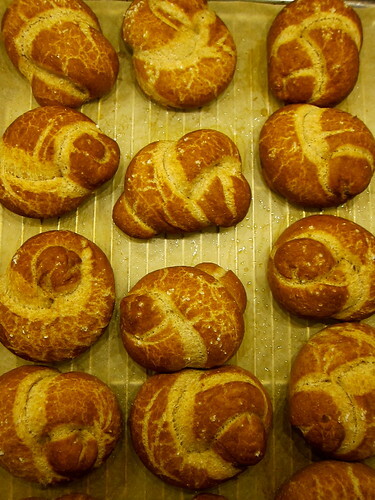 This entry was posted in cooking and tagged baking, flour, local flour. Bookmark the permalink. Your rolls look absolutely delicious and I thank you for the information on local flour. I had no idea. I plan to post more about local flour — they still take some effort to find, but the range and availability is growing! That is impressive – 50% Maine grown flour! Those rolls will be tumbling out of my kitchen sooner rather than later, many thanks! I’ve also some 100% Maine flour from Maine Grains, a sifted whole wheat grown and milled locally. In New Hampshire, Brookford Farm offers a whole wheat bread and whole wheat pastry flours; both are available through them at the Seacoast Eat Local Winter Farmers’ Markets! These rolls look adorable! I’ll definitely check the recipe. I love their warm color. I have tried it to many times but never did it perfectly. i think your recipe is gone help me. looks very delicious cant wait to have it. I’m on my way through this recipe as we decided we needed bagels. I’m using this recipe but will switch to bagel mode when the dough is ready to shape. I have already ran into a snag. I live in the UK and while it is easy to get buttermilk, it is different than what I remember in the States. The buttermilk here is real thick and rich. I put my buttermilk and butter into a microwave measuring cup to heat it and melt it. It warmed up then when I took it out it had separated. Not only separated but there were chunks of cottage cheese like stuff floating around. I tasted the chunks and it was like mozzarella! So had to start over. Just mixed the remaining buttermilk (it comes in about a 8 oz cup) and skim milk to make the desired amount. 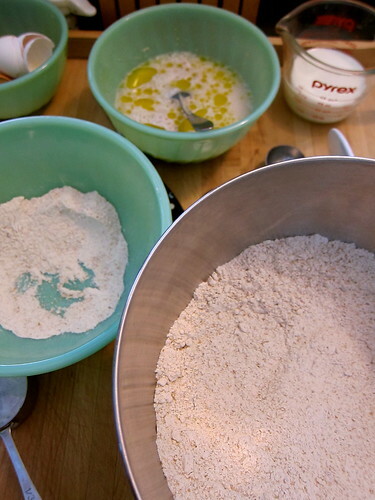 I also added a step to autolyse the flour and yeast, and give me a moment to type this. I look forward to the results (I think). Thanks for posting your article, obviously inspiring.